Lacey was focused on her acting career and saw boys as a distraction. She was determined to convince her dad, that acting was important to her and her future, but first she had to sort out her feelings for Donavan, and uncover who was sabotaging her on the set. Pro: Lacey was so easy to love. She came across as likable and authentic. Her worries and fears were plausible, and I really admired her focus and determination, as she tried to juggle the movie, school work, her dad's interference, and her burgeoning feelings for Donavan. Pro/Con: One of the things I wished there was more of was Donavan. He was great, and I would have loved to get to know him even better. I know I kept wishing there were more scenes with him and Lacey together, because I really enjoyed watching them on page together. Pro: West always includes family focus in her books, and the dynamics here were sort of interesting with respect to Lacey. I really felt Lacey's struggle with adjusting to life with her non-custodial parent, while missing her mom and siblings. I also got to meet Donavan's sister, who was cute as a button, and shared a very endearing bond with her big brother. Pro: The romance was, as I expected, very sweet. I loved the way Lacey slowly came to realize her feelings for Donavan, and I was solidly aboard this ship. Pro: It was fun being on the set and getting a look into the day to day life of "stars". I enjoyed seeing the friendships between Lacey and her co-stars develop, and the cameos from the Love, Life, and the List couple made me smile. The mystery of who was sabotaging Lacey was not very necessary, but I thought it added another level of fun to the story. Pro: This was a solid 4-star read, but the ending made me so happy, I bumped it up a half star. West did so many things right in that last chapter, and I can only smile and think fondly about it. Overall: Once again, West left me with a smile on my face and a light heart. It's always a delight to read a one of her books, and as always, the story was fun and cute with friends, family, and an adorable romance to round out my overall enjoyment. But when June's condition sends her to the hospital and Nick's latest crime threatens to land him in prison, the two decide to run away. 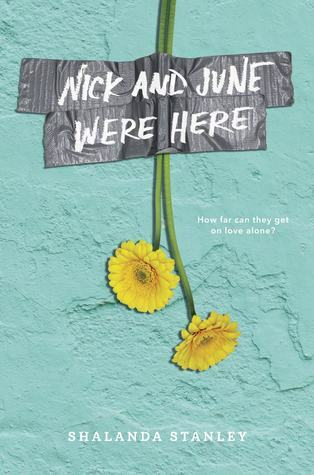 When the world is trying to tear them apart, can Nick and June find a way to stay together? Warning: This was not a fluffy, simple, two-teens-in-love story. This was a story of a love that survived and flourished despite some really difficult circumstances, and about the tough choices one must make for those they love. Pro: My emotions were all over the place reading this book. Both Nick and June had serious issues to deal with. Nick was trying to escape a life of crime, and June was dealing with her recent diagnosis of schizophrenia. These were the really painful parts, but the parts, when Nick and June were able to just be NickAndJune were beautiful. Pro: I personally thought June's hospital stay was well done. Her sessions with the doctor and the steps taken to diagnose her, rang true for me. In general, the mental health issues were handled thoughtfully and with care. Pro: I guess the main focus was the love shared between Nick and June, but familial and non-romantic love was also explored, and it was done quite beautifully. Pro: It's impressive, that this didn't turn into some over the top drama. If you look at all the pieces, it totally could have, but Stanley carefully crafted the story, and each element was used judiciously, resulting in something that was really meaningful and pleasing. Pro: Every character was well drawn. It was easy to feel something for each and every one of them, and my heart especially ached for Nick, June, and June's parents. Pro: At one point, I put up an update about how I felt this story couldn't end well, and I was sort of right. It wouldn't have been realistic if it did, but what Stanley gave me, was an ending that was real, but hopeful. Overall: An achingly beautiful love story between two people, who had so many obstacles in their way, but were determined to love each other in defiance of it all. Miriam's family should be rich. After all, her grandfather was the co-creator of smash-hit comics series The TomorrowMen. But he sold his rights to the series to his co-creator in the 1960s for practically nothing, and now that's what Miriam has: practically nothing. And practically nothing to look forward to either-how can she afford college when her family can barely keep a roof above their heads? As if she didn't have enough to worry about, Miriam's life gets much more complicated when a cute boy shows up in town . . . and turns out to be the grandson of the man who defrauded Miriam's grandfather, and heir to the TomorrowMen fortune. His family had made their fortune from the TomorrowMen, while her family watched from the sidelines. Can Mir and Weldon rise above their family history and forge a relationship? Pro: I was actually a big Weldon fan. He had quite a bit of baggage to unpack, and I was glad Nova Scotia was a hospitable place for him to do it. Pro: The romance was very sweet. I liked how Mir's feelings for Weldon snuck up on her, while Weldon was sort of gooey from the start. Pro: The Hendricks were such a fabulous family, and Mir's household may have been physically shabby, but it was filled with love and parents, who were genuine and supportive. Pro: Hicks has an obvious love for comics, and some definite feelings about the comic and superhero industry. There is some intriguing commentary in the book that had me nodding my head. I also really liked getting a peek at what goes into writing and illustrating a comic. We got to hear from an artist in the book, as well as tagging along as Mir and her friend attempted to write a comic script. Con: Don't get me wrong, I really thought the ending was nice and sweet and I was rather happy with the resolutions, but it felt a little rushed to me. Pro: This wasn't just a romance. Both Weldon and Mir were struggling with some issues relating to letting go and moving on, which were definitely themes for several characters in this book. Mir and Weldon grew over the course of the book, and it was clear in the way their approach to this issues changed. Overall: An adorable romance with a side of coming-of-age and geekery, which was fun and light and smile inducing. ** ARCs received in exchange for honest reviews. Sounds like another hit from KW. I took a break from her for a while because I read two in a row that were kind of meh (well, one was okay and one I didn't like). I might give this one a try, though. When I like her books, I really, really like them. 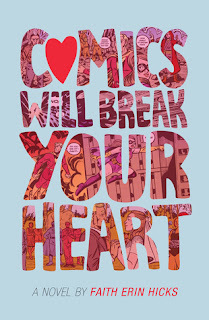 :) I only recently heard of Comics Will Break Your Heart and I like the premise of that one. Definitely a bigger story that "just" romance. Her books just work for me. I did want more romance, which was my issue with Lucky in Love. It just seemed like a waste of a great "hero", but the story was strong enough to make up for it. Comics was way more complicated than just romance. The big theme, for me, was letting go and moving on, which I think is something everyone is faced with at some point in their lives. Yay so glad you enjoyed the new West book. Love her so much and need to get to this one (and her last) soon. Her books are always solid happy reads for me. Great reviews! It was everything I expect from West - fun, cute, sweet romance, good family focus. They work for me. The West book is on my "Must Read Very Soon" list, so I'm glad you loved it. And I also think that Comics looks really sweet. Great reviews! Nick And June Were Here sounds intense. I love that cover, though. Nick and June was definitely the heaviest of the three, but Stanley tempered the heavy with some really tender and beautiful moments. I haven't heard of any of these, but I'm so glad they all worked for you! I've heard really great things about Kasie West's books! Kasie West is a go-to for me. Even if I am not blown away, I am left happy by her books and never regret reading them. It was very cute, and I was fun of the cast. It was a good bunch she put together. Add in the movie mayhem, a little romance, and family drama, and it was a very satisfying read. Ooh, Comics Will Break Your Heart is one I want to read! I haven't read Kasie West, don't know if I will. The 2nd book sounds good, I hadn't heard of it before. Great reviews! You can check out my last YA review HERE. 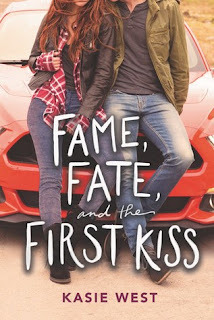 Kasie West is my go-to for warm-fuzzy-fluffy YA romances. I always enjoy them. I lean lighter, but Nick and June was done well. Stanley kept it balanced. So, although it had moments that were really emotional and kind of sad, it was hopeful. I have been meaning to try a Kasie West book for ages. Your comments about the focus on family definitely appeals to me. The other books sound great too. West always includes a lot of family focus and friendship too. I always enjoy her books. I say this all the time, but I really do need to read Kasie West - her books sound so adorable! I put her in a group with Emma Mills, for the way they balance family, friendship, and romance in their novels. They also include more serious issues without the book becoming a heavy issues book. That's the draw for me. Kasie West's novels are always so adorable. I can't wait to check this one out. Lovely mini-reviews! They really are, and that is why I continue to come back, each and every time. Comics will break your heart sounds so interesting to me? I would have loved if it included some comics artwork in there as well but I am curious to know more about the comics industry. I wish the ending wasn't rushed though! 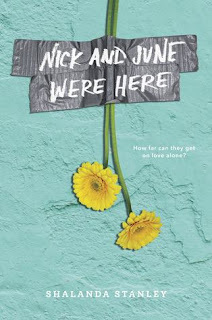 Nick and June were Here is another one is why I want to try and read this! I really think it has a lot of difficulties and challenges which are hard to overcome and work through, but you make it sound like the love is so evident and present. Hicks' artwork is actually pretty amazing. She illustrated the upcoming Rainbow Rowell graphic novel, and the illustrations look fantastic, but yeah, no pictures in this book (that I know of, since I did read the digital galley). The ending wasn't bad, though. It was actually quite nice. It just felt a little quick/abrupt. Nick and June was heartbreaking and heartwarming. A little sad, but I thought the ending was not dismal. It pointed towards maybe something promising for the future. 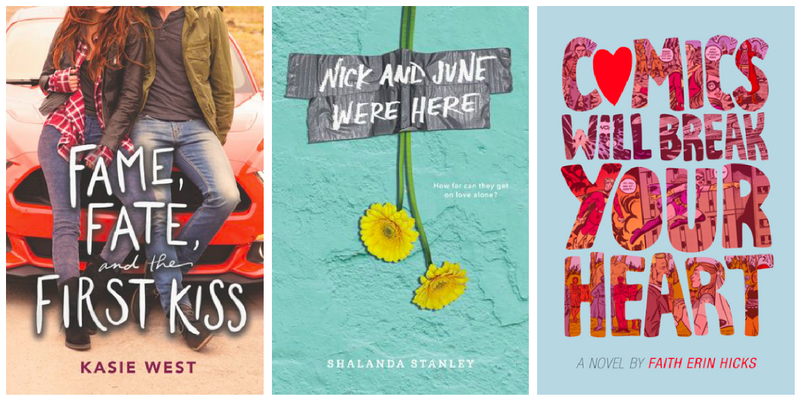 Other than Nick and June, they were very fun, and I have no reading regrets, which is always a plus. I like your nutshell reviews. Thanks for sharing some new to me books. Thanks! Glad I could show some love to these books. The story was fun and the characters were great, but like with Lucky in Love, she underutilize a great love interest (in my opinion). The family focus was sort of different from what she usually does, but it was really interesting too. Fame, Fate, and the First Kiss sounds absolutely adorable. And I love that Kasie West's female characters are always super easy to connect with and like. I had a miss, with one of her books a few years ago, and haven't picked up one since then. But this sounds like the perfect book to jump back into her stories! Even my least favorite West book was good for me. Not amazing, but still fun and made me smile, which is why I will always pick them up. I've had both good and bad experiences with Kasie West, but I like the sound of this newest one! I do want to catch up on her older releases though, because I don't want to miss little things like character appearances! I think the only one that was only ok for me was Lucky in Love, but even that was still cute and left me feeling satisfied. I like her characters and the family element that is always present.